Evernote is a cross-platform, freemium app designed for note taking, organizing, and archiving. It is developed by the Evernote Corporation, a private company headquartered in Redwood City, California. The app allows users to create a "note" which can be a piece of formatted text, a full webpage or webpage excerpt, a photograph, a voice memo, or a handwritten "ink" note. Notes can also have file attachments. Notebooks can be added to a stack while notes can be sorted into a notebook, tagged, annotated, edited, given comments, searched, and exported as part of a notebook. Evernote supports a number of operating system platforms (including OS X, iOS, Chrome OS, Android, Microsoft Windows, Windows Phone, BlackBerry 10, and webOS) and also offers online synchronization and backup services. Evernote is available in a paid version or a more restricted free version. Use of the online service is free up to a certain monthly usage limit, with additional monthly use reserved for Plus subscribers, and unlimited monthly use for Premium customers. The free version will be perfectly adequate for most users. For a more detailed explanation of the different types of Researcher envisaged by the History Club, and their interaction with Evernote, please click on SHARING EVERNOTE. 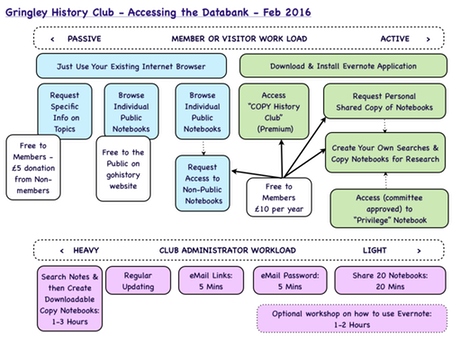 To download the Flow Chart called "Gringley History Club - Accessing the Databank - Feb 2016" click HERE. Evernote offers new users the opportunity to run their Application as a "web client". This means you log on to www.evernote.com and try to search notes within that. This will also automatically happen the first time you click on one of the Notebook links in the main panel of this Webpage. Joining the Notebook will import the shared Notebook data into your own version of Evernote so that you may view everything in the shared Notebook any time, from any device you have connected to Evernote. However you will not have editing rights. If instead you choose to View the Notebook, you will View the Shared Notebook anonymously, via the web browser. We have now been going 5 years and we have amassed a comprehensive and detailed databank of historical information on Gringley history right up to the present. This information is now stored in two ways - a physical archive where we have documents or albums or even 3D objects under lock and key, and then an electronic databank of everything we have been given or have borrowed for scanning. This electronic databank is greater in reach and depth, and it is comprehensive, integrated and index tagged. While this electronic databank is accessible to researchers or casual browsers of every type, it is now too vast and detailed to be published directly on this History Club website. Instead links are available within the NOTEBOOKS page. Our unit of storage is a Note, which might contain only one paragraph, but might also contain an album of dozens of separate photos or press clippings. We now have 870 Notes of which 200 are picture based Notes. These picture-based Notes contain about 700 individual pictures altogether, while the remaining document based Notes contain over 2000 individual pages. Every Note is index tagged for searching purposes within an application called Evernote, which runs freely on most computer platforms, and which anybody can use for nothing! Notes are grouped into about 20 Notebooks based upon their origin and format. A Note can only appear in one Notebook, but a Notebook can contain many Notes. Most Notebooks are available to ALL categories of researchers. Foremost among the exceptions are the two Notebooks: "Awaiting Classification" and "Privilege". The former is self explanatory and contains any Notes still being worked on for editing or tagging. The "Privilege" Notebook contains either sensitive or copyright material that it is not appropriate to make freely available. The 19th Century Census entries for Gringley, the School Register, fully scanned copies of published books reside in here. Two members of the Club committee must pre-authorise release of this material. Of the remaining 18 Notebooks, 13 are accessible to any casual researcher by down-loading directly from this website. 5 other Notebooks are only fully available to paid-up Club members (cost is only £10 p.a.) and access is unlimited. For the full list of Notebooks and their permissions including the Notebooks Table of contents please go to NOTEBOOKS directly from here. For a more detailed explanation of the different types of Researcher envisaged by the History Club, and also their interaction with Evernote, please study or download the CHART below, and also click on SHARING EVERNOTE.